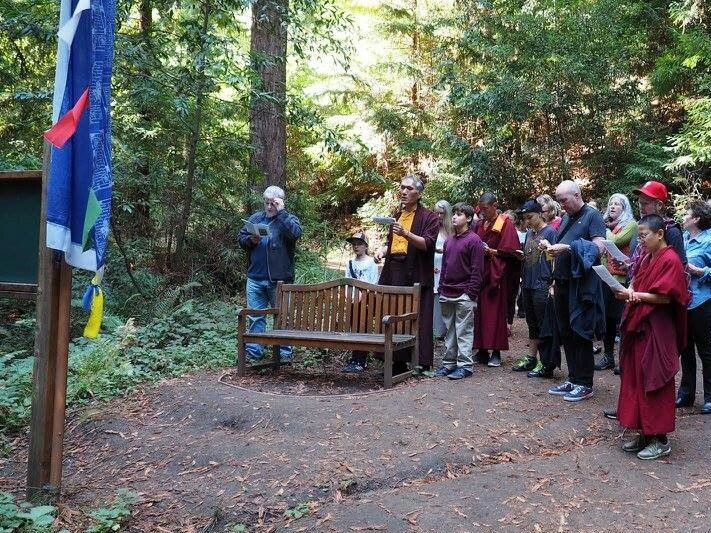 Land of Medicine Buddha provides classes and space for group and personal retreats, on a forested piece of property at the foothills of the Santa Cruz Mountains, just a mile and a half from Soquel Village, California. We are an active Buddhist community. Through teaching, meditation, prayer, retreat and community service, we engage in preserving and transmitting the Mahayana Buddhist tradition and values, specifically in the lineage of Lama Tsongkhapa. Click through on the links below to find out more about our spiritual program - Dharma - or about our facilities - Staying. Find out more about us. Don't get stuck on the wrong side of the gate. 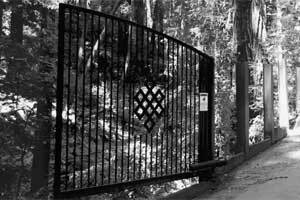 If you are an overnight guest, be sure to keep the gate code with you. If you are a pedestrian, be sure to be off the land before the gate closes automatically at the end of the day. Enjoy your visit. And thank you for coming to Land of Medicine Buddha. The first full moon in the Tibetan lunar calendar is celebrated as the Day of Miracles, or Chötrul Duchen, which commemorates the final day of miraculous display by the Buddha which lasted 15 days. The Buddha performed the miracles in response to a challenge from six rival teachers. These 15 days are merit-multiplying days in which any virtue created is magnified millions of times. Chötrul Duchen, which falls on 19 February 2019, is also the most special day of the Mönlam Chenmo, the Great Prayer Festival, where thousands of people, lay and ordained alike, pray, and make offerings of food, tea, lights or money to the Sangha. The Western year 2019 corresponds with the Tibetan year 2146, Female Earth Pig. 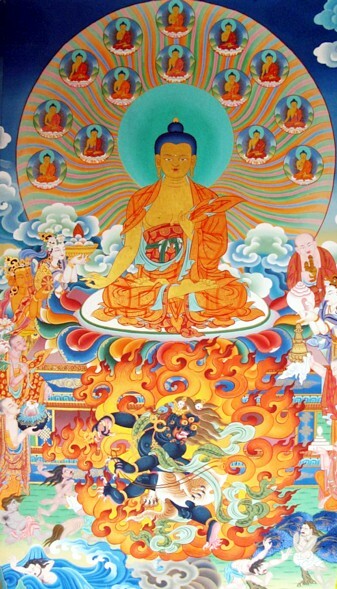 At Land of Medicine Buddha, this year, on Losar (Tibetan new year) we will have a traditional Tibetan-style morning of pujas on Tuesday, February 5, (9am), and then an Extensive Medicine Buddha on Sunday, February 17, (2pm), close to the end of the Days of Miracles, still within the multiplying days. Nevertheless, feeling that he should respect King Bimbisara’s feelings, the brother decided to give a feast, offering food and gifts to all who came. The six teachers came and sat in the highest seats. When Buddha and his disciples arrived, they walked toward the few remaining seats, but before they could reach them, the six teachers found themselves getting up from the highest seats and taking the lower. They tried three times to take the higher seats, but each time found themselves in the lower. Finally, feeling ashamed, they remained there.